We continue our journey from interlaken and set off to Jungfraujoch. Along the way, we made a stop-over at Murren and drop our baggage. We got a surprise while waiting at Mürren station. There was a huge crowd and everyone was holding onto a ski board. I thought to myself “Ah Wouldn’t it be great to know how to ski? Especially in Switzerland!.” Unfortunately, it was just a 10 second thought because i am so kia-si (scary cat). I think i will break an arm or both during my attempt to ski. We left our luggage at the guesthouse and set off to Jungfraujoch. 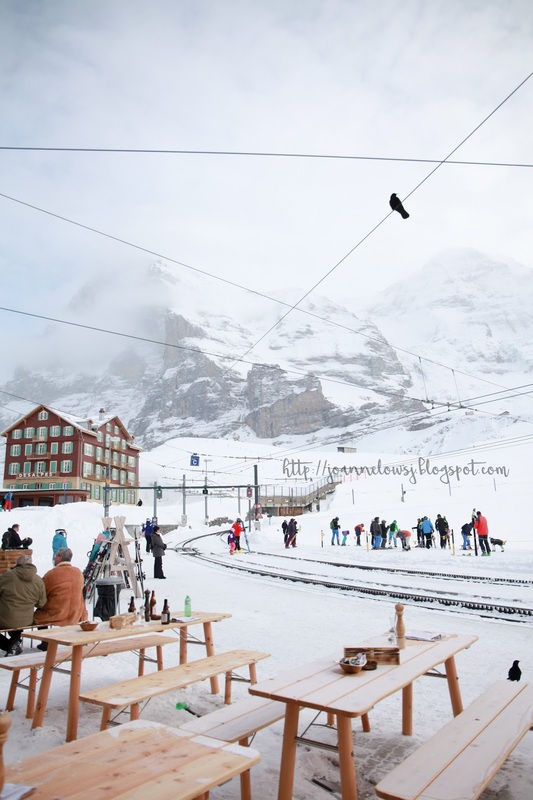 At an altitude of 3454m, the viewing point from Jungfraujoch is one of the most popular attraction in Switzerland. Standing at the top and at -20 degree, the feeling is amazing! Unfortunately, We only spent a few minutes out there because the wind was too strong and the cold was unbearable. I can imagine this place to be even more gorgeous during different season! We also met the black bird that refuse to move and take selfie. Too cute! 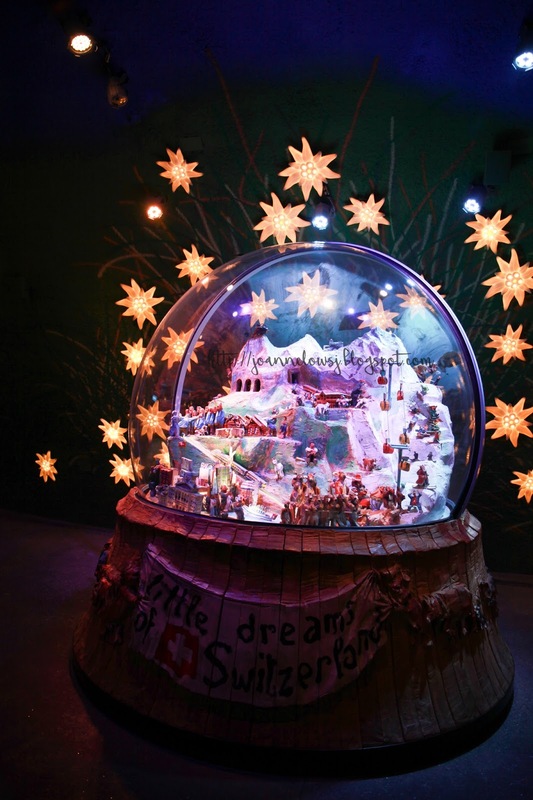 Other than the viewing point, there is an Ice Palace with many ice sculptures. The Alpine sensation is a moving walkway with images, light and music. 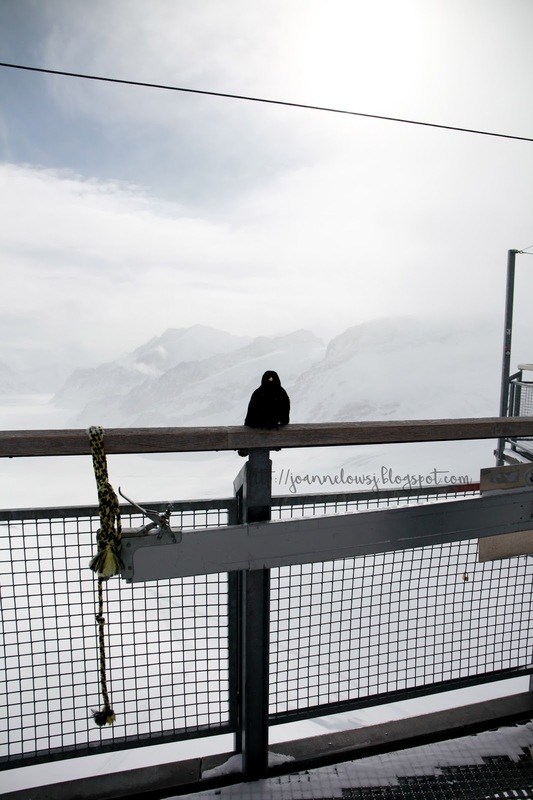 Unfortunately, while we were there, a part of Jungfraujoch was closed. 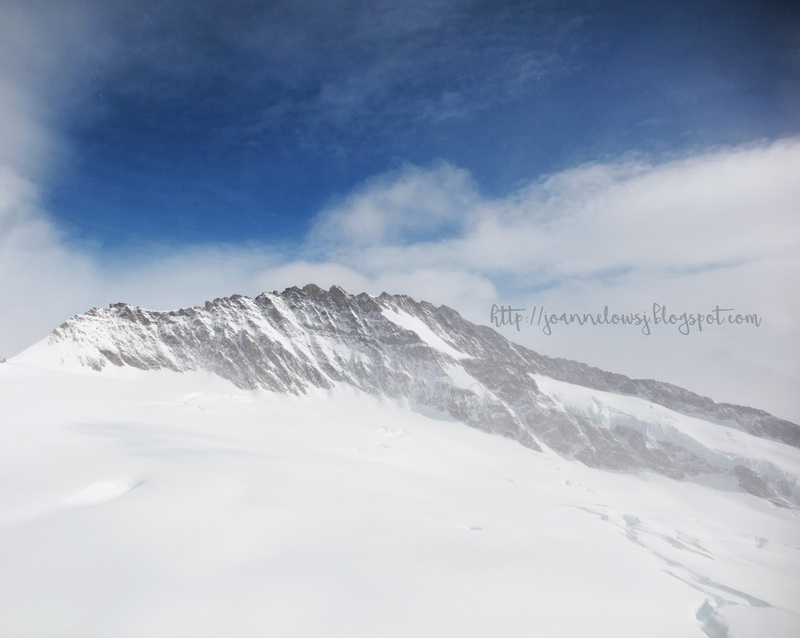 It would have been nice to enjoy the view of Grosser Aletsh glacier but due to bad weather, the pathway was affected. Personally, i think the official website should update the closure. 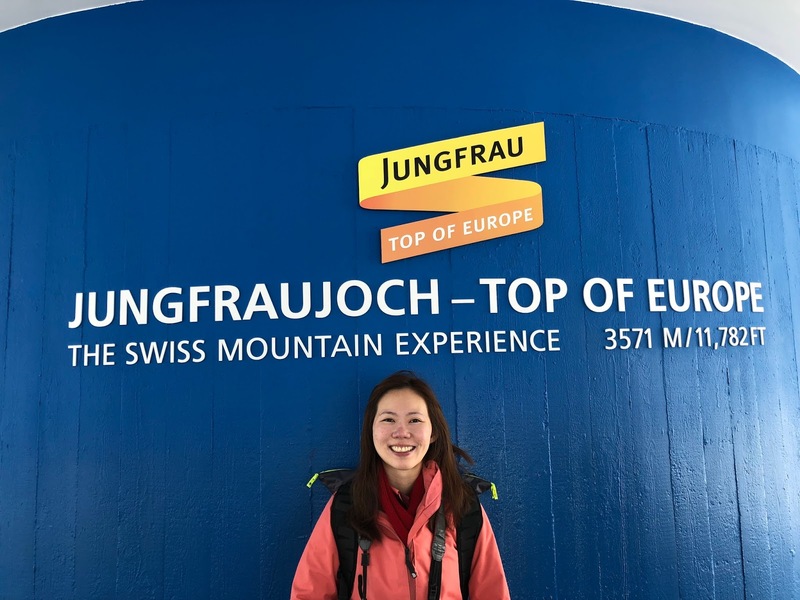 After all, visiting the Jungfraujoch is not cheap. We could have visited Gimmelwald instead. We had spent half a day there and went back to Mürren. 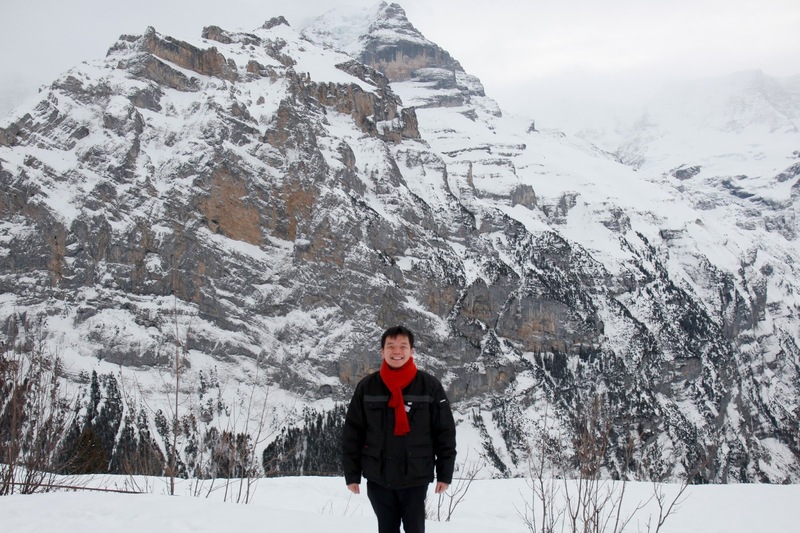 Initially, we wanted to spend a night at Gimmelwald instead of Mürren. Unfortunately, the guesthouse was fully booked. At the foot of Schilthorn Peak, Mürren is a car-free village and accessible by cable car. 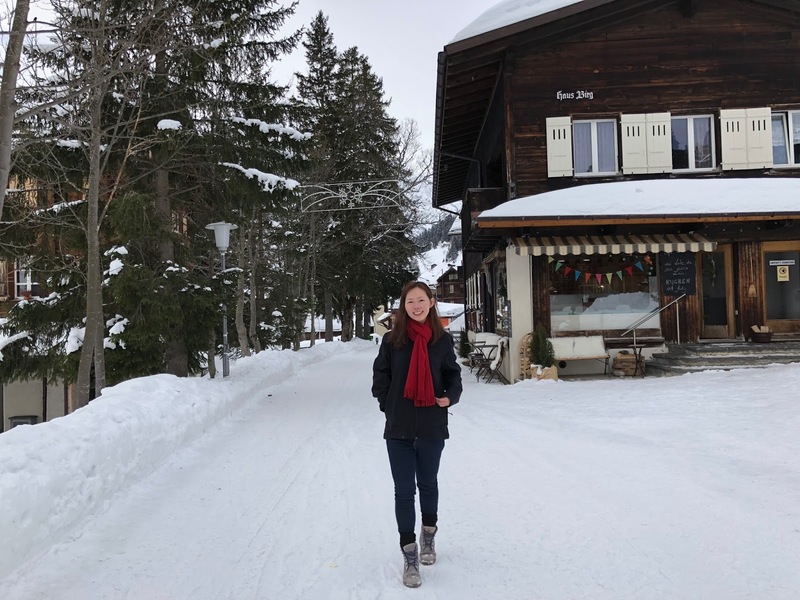 The Swiss mountain village is charming in its own. I love waking up with views of Alps in the morning. 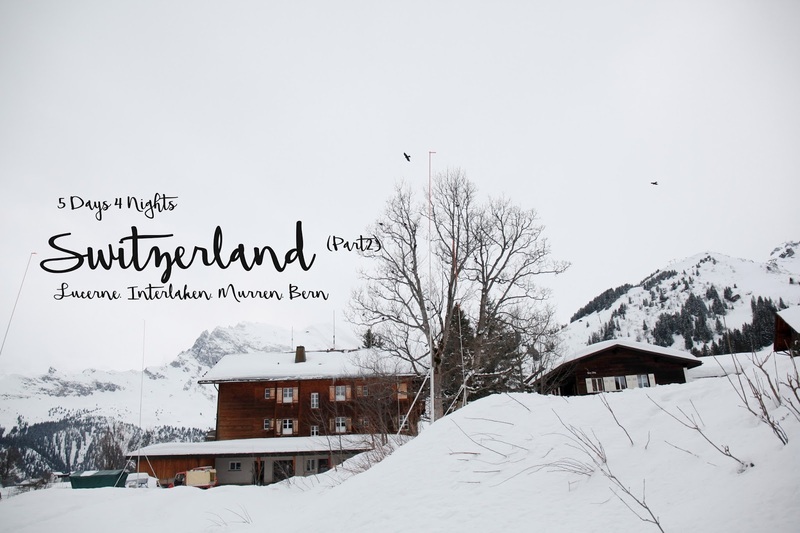 Even if you are not planning to spend a night in Mürren, a day trip would be equally memorable. In the evening, We kept our stash of instant noodle and eat out at La Grotte. 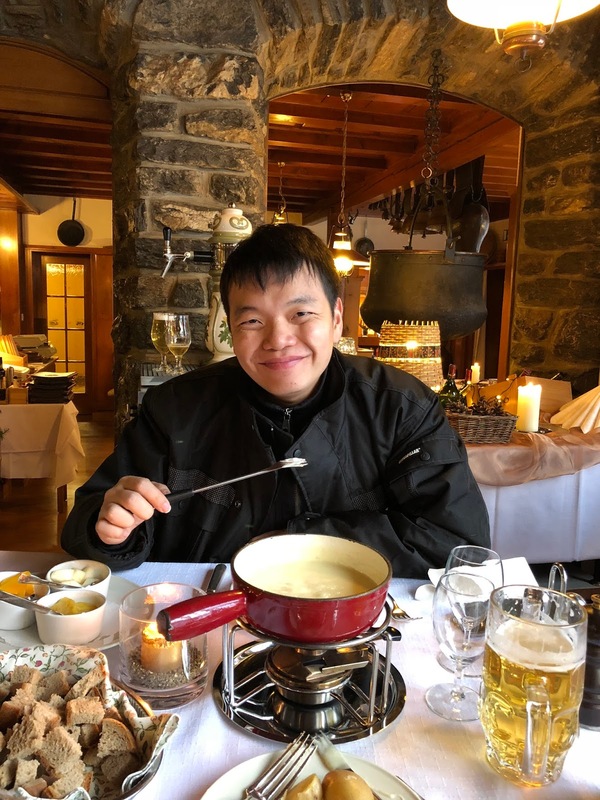 It is definitely one of the most memorable experience because the cheese fondue was so good we thought of making our own when we get home! 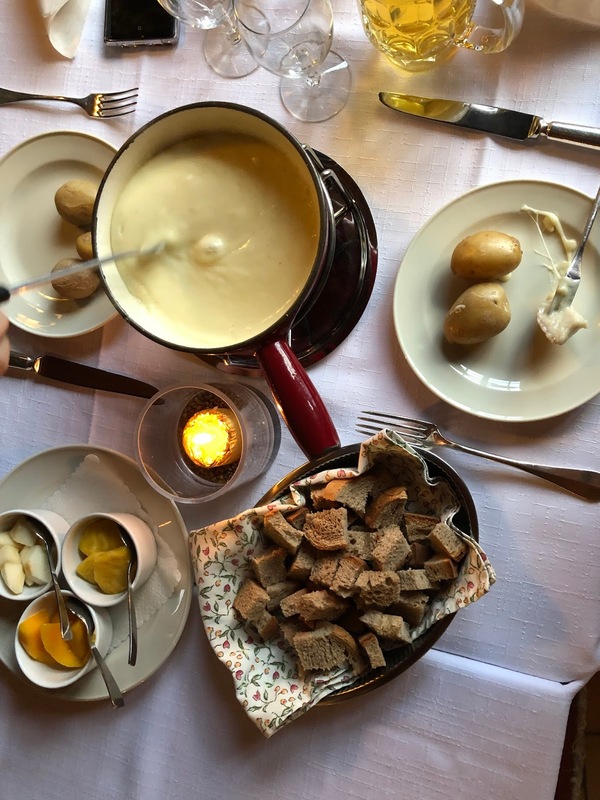 The cheese fondue is a combination of melted cheese and cherry wine served in a communal pot. 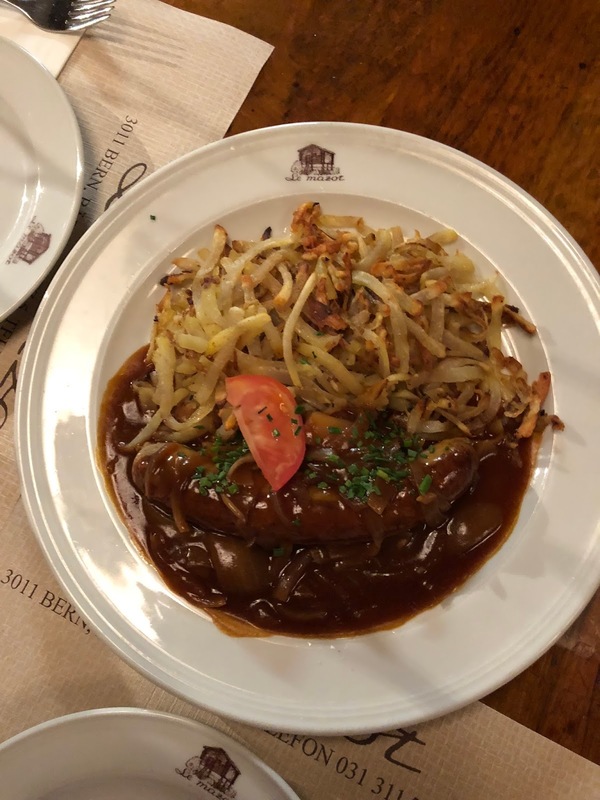 Personally, I thought that a perfect Rosti need to be crispy on the outside and soft in the inside. So glad the one we had was close to that! The rosti was perfectly scaled. Although only 2 simple ingredients, it is not easy to master. 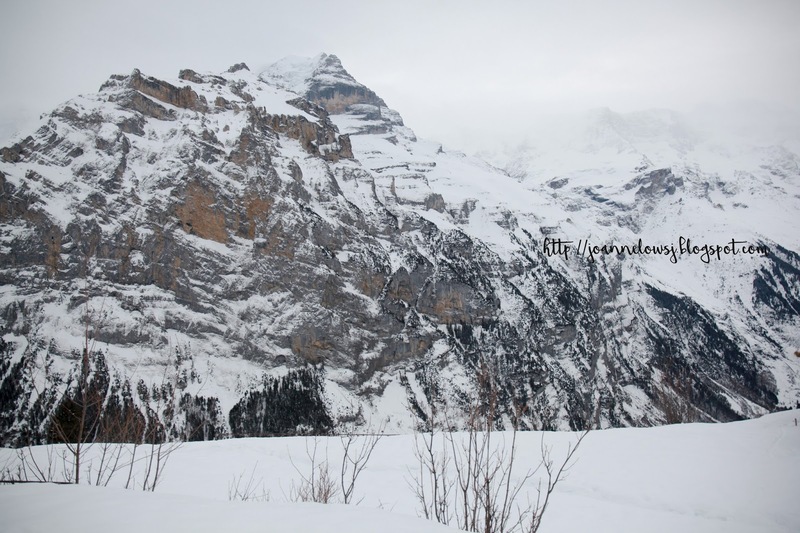 Both H & I agree that Mürren is our favourite place throughout the trip in Switzerland. The village is beautiful and quiet. Everything is gorgeous! If we were to return to Switzerland one day, Mürren will definitely be in our list. We bid goodbye to Mürren and left for Bern - the capital of Switzerland in the morning. 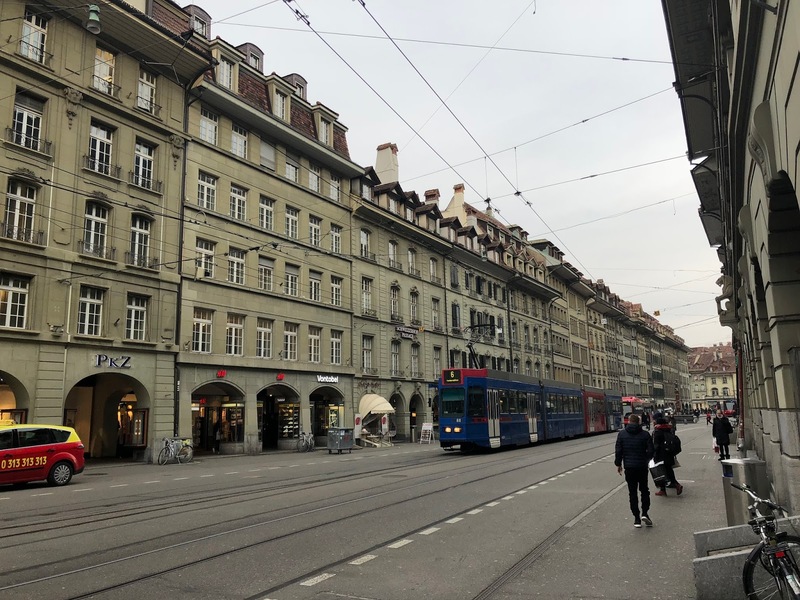 Unlike the places we have been to, Bern has a gorgeous backdrop of Alpine view with well-preserved historical architecture. This city is easy to explore and you can do a DIY walking tour if you would like to. H & I decided to keep it easy and simple. We took a stroll in the Rose Garden. Although the roses are not in season, we had a good view overlooking the Aare river and Old Town. 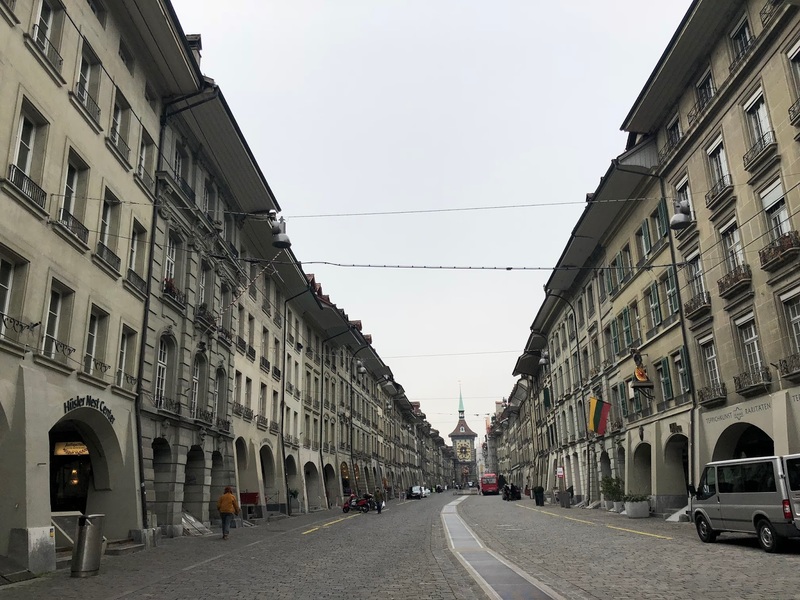 We continued our walk to Old Town and stop at the iconic landmark of Bern - Clock Tower from the 13 century. 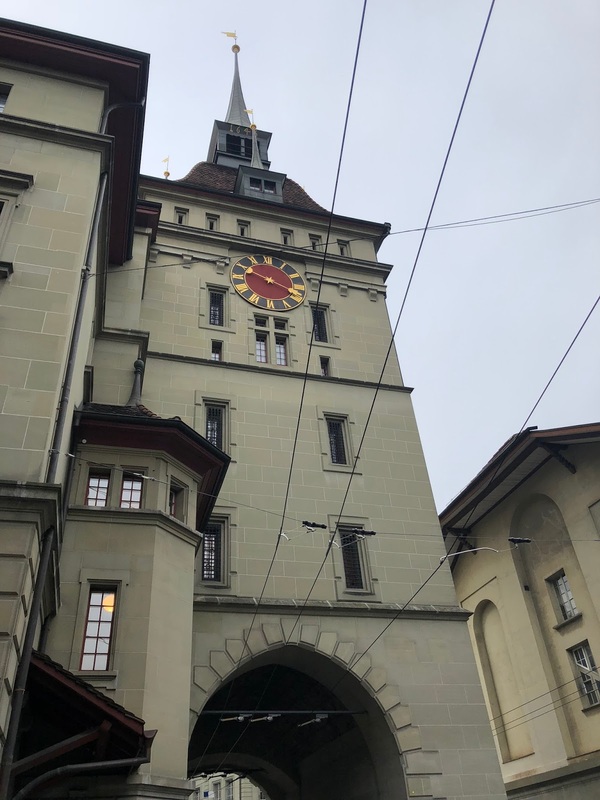 One of the oldest clock in Switzerland, the tall clock stood out from far. Also, one can climb to the top for best view. Along the same street with Clock Tower, there are lots of gorgeous fountains that is potable. 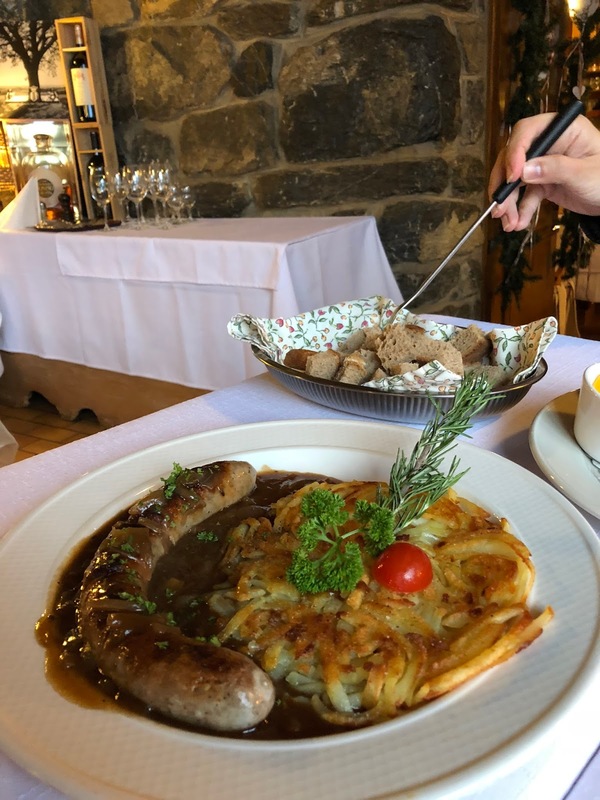 Feeling hungry, we stop at one of popular restaurant that sells Rosti - Le Mazot .Unfortunately, we both felt that the Rosti reheated because it was not crispy on the outside and was soggy. 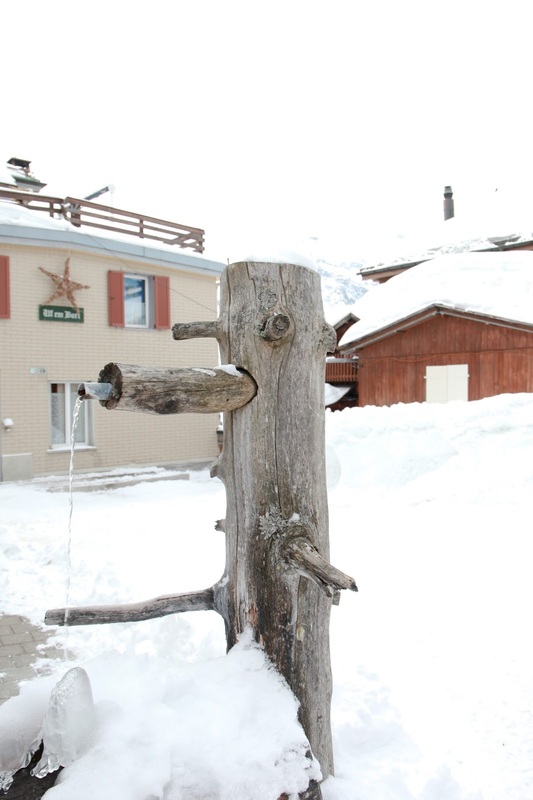 This is nowhere as good as the one we had in Murren. It was so bad that even the frozen Rosti we bought from supermarket is better. 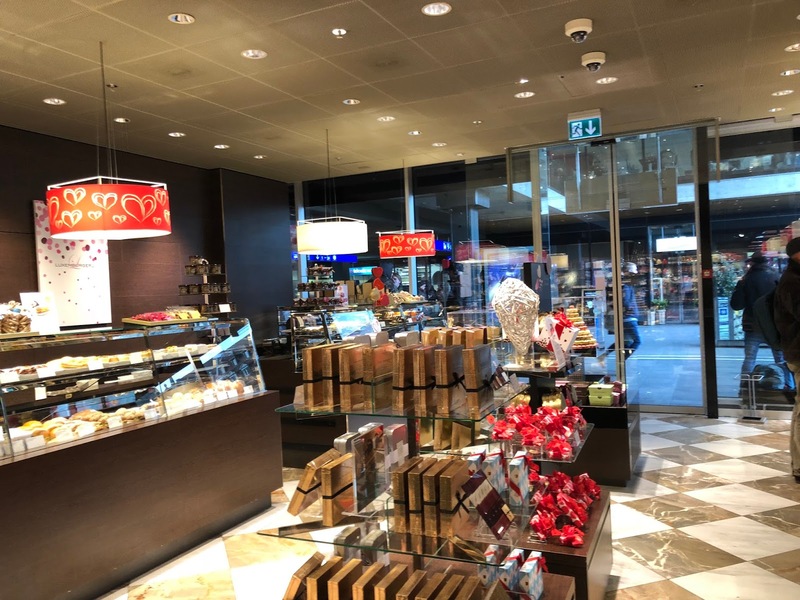 We continue to explore old town and chance upon Sprungli – A luxury confectionery manufacturer in Switzerland. Famous for their Luxemburgerli, these small and cute macarons caught my attention. The macarons are light and airy. Plus, there is a wide range of flavours to choose from. The flavour of the month - Citrus was H’s favourite. Not too sweet and had a tinge of lemon taste. 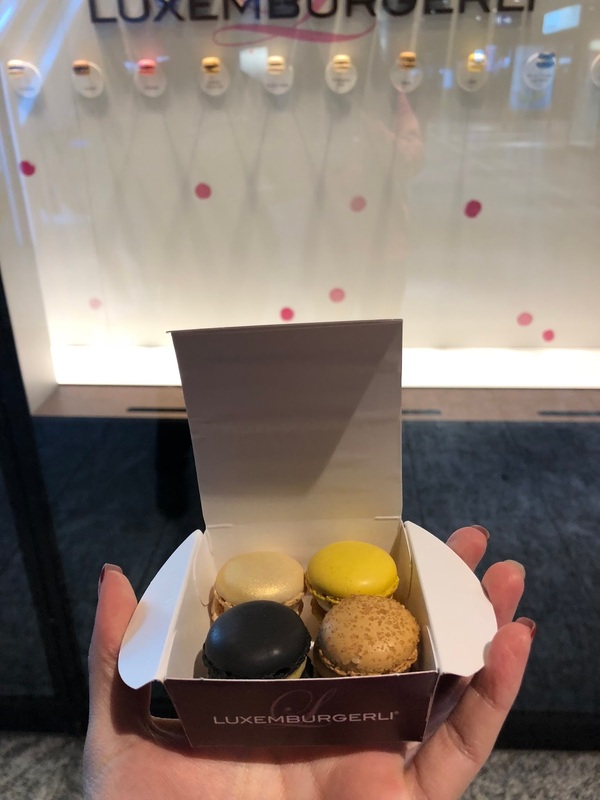 My favourite was the salted caramel flavoured Macaron. It had the burnt sugar taste and was creamy. We end our last night in Switzerland with an unforgettable Italian dinner at Azzuro Terra & Mare. 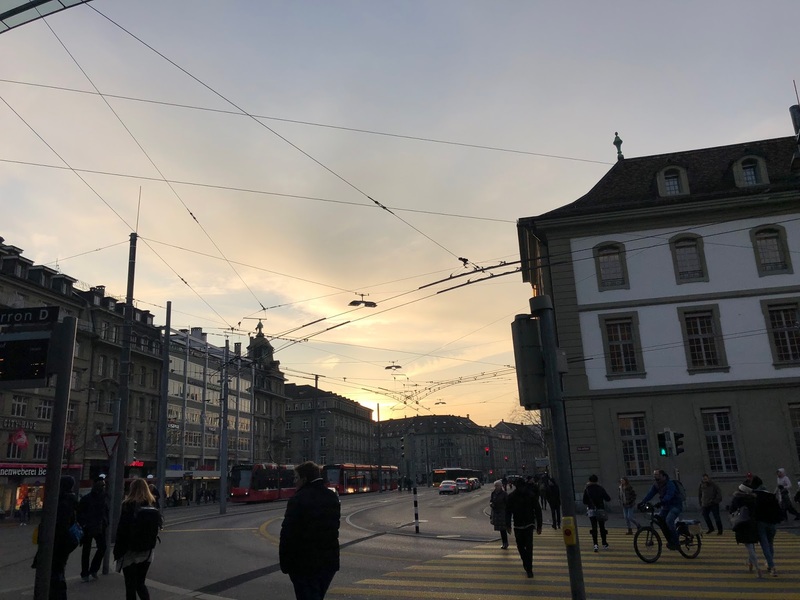 We ask our airbnb host for her personal favourite restaurant in Bern and she recommended Azzuro but warned us about the long queue and reservations. Seems like the Swiss we met are all Italian food lover. 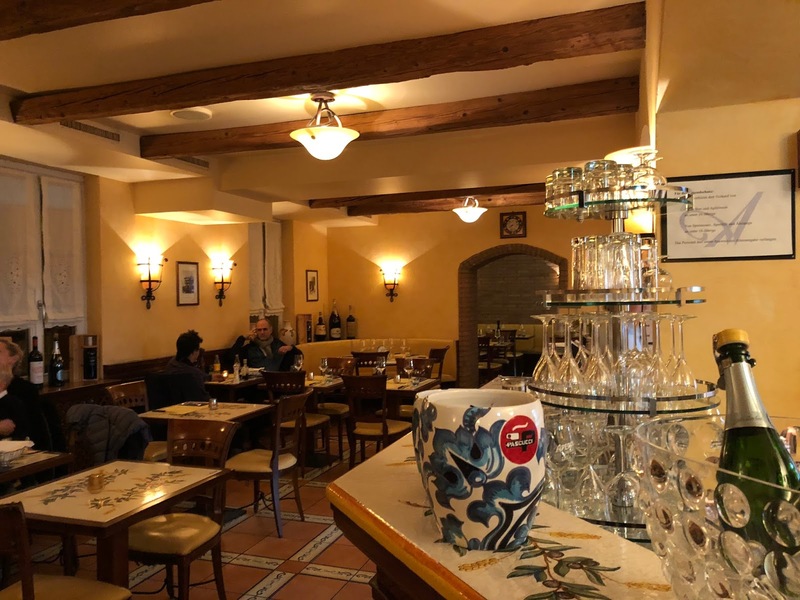 When we google online, we saw that the restaurant received the " Ospitalita Italiana" seal in 2013. The award is given to restaurants that guarntee the quality of italian culinary culture by the chamber of commerce and industry in Rome. Coming from a foodie perspective, we knew we had to try it out. So, we went there early. Thankfully the staff from Azzuro was friendly and invited us in even before they officially open. Now, lets get down to some serious talk. 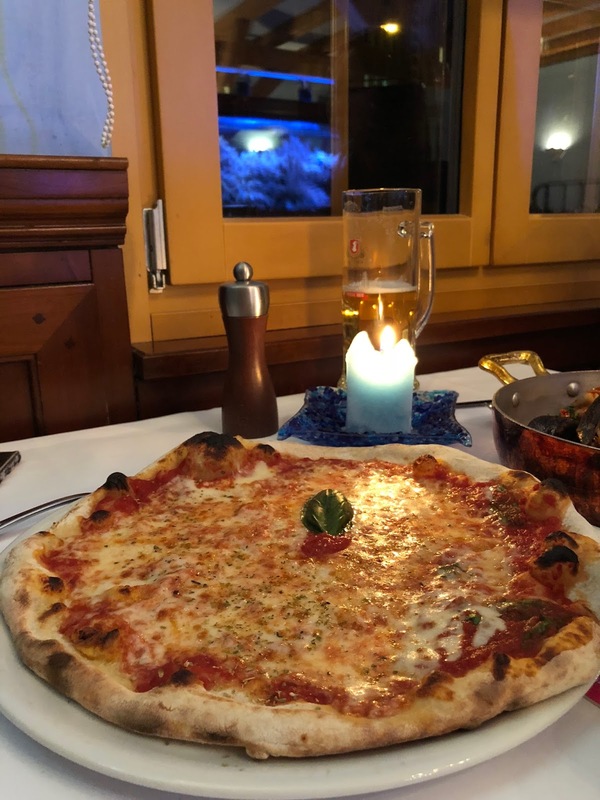 They served the best Magarita pizza we ever had! It was perfectly bake in wood fired and the tomato base was rich. To top it off, the crust rises unevenly with slightly charred on the outside, making it crispy. It was airy and H finished his pizza in seconds. Just kidding, I was exaggerating. He enjoys his pizza slowly. 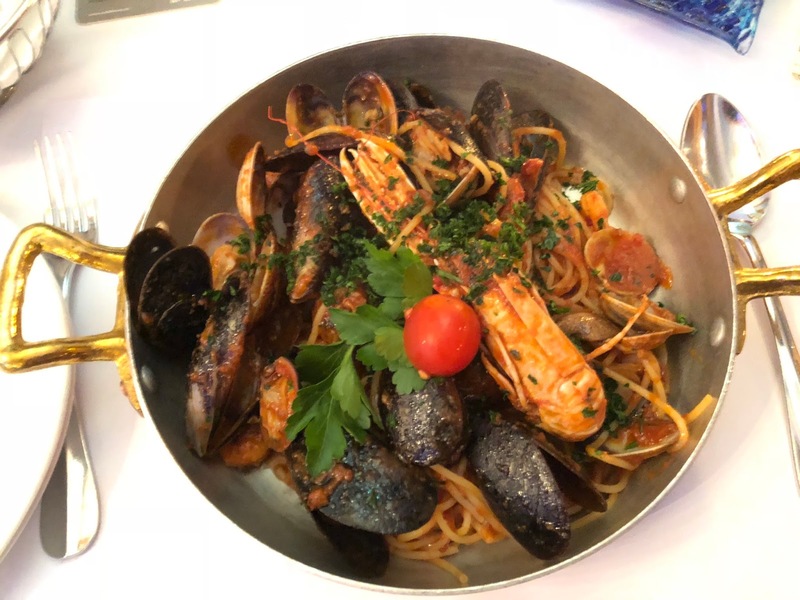 I ordered the seafood pasta and was surprised by the portion. It was huge and the seafood looks like it was perfectly plated for me. Although the pasta did not blew my mind away, it was good. Pasta sauce was refreshing and seafood was fresh. Although, I find it a little salty to my liking. We ordered Tiramisu to end the night. It was superb! 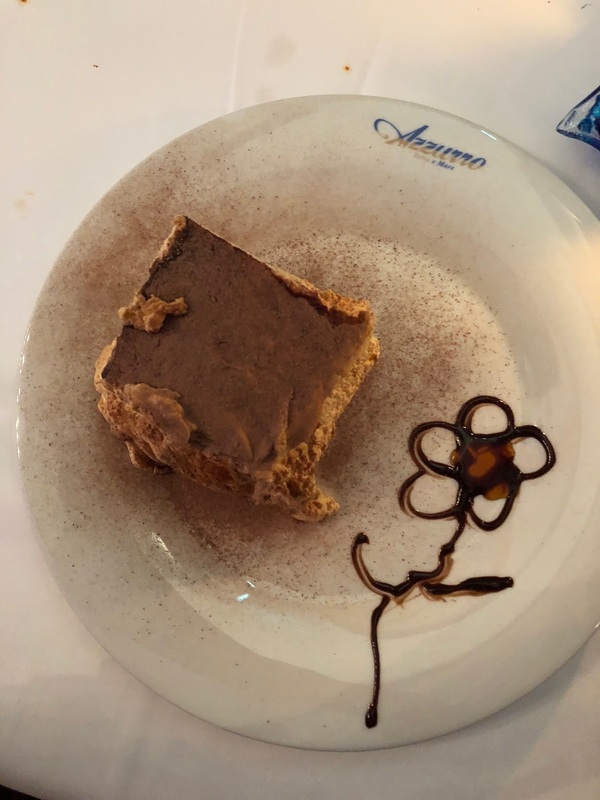 The Tiramisu was rich, creamy and tasted a little like ice cream. Overall, H & I really like the restaurant. Good food and Service! So glad we made the trip down. 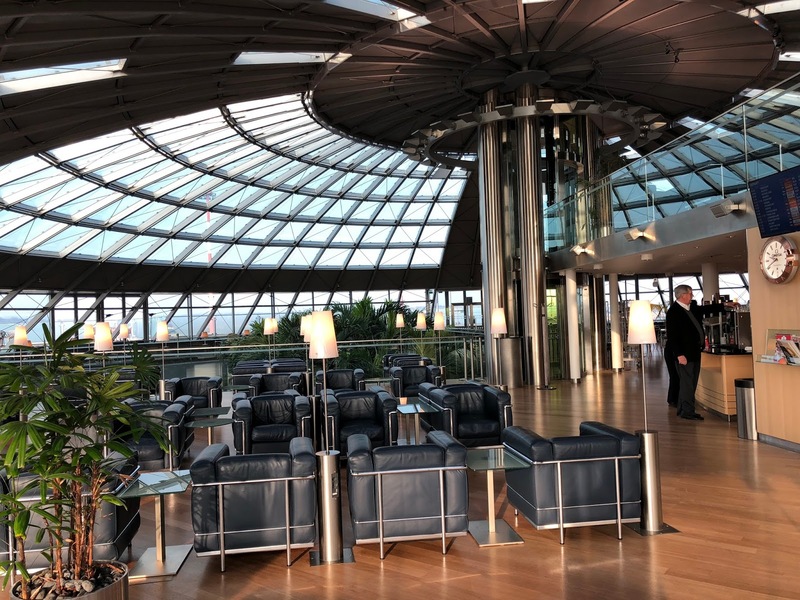 The next day, we set off to EuroAirport Basel and killed some time at the award winning Priority Pass lounge before flying to Iceland. 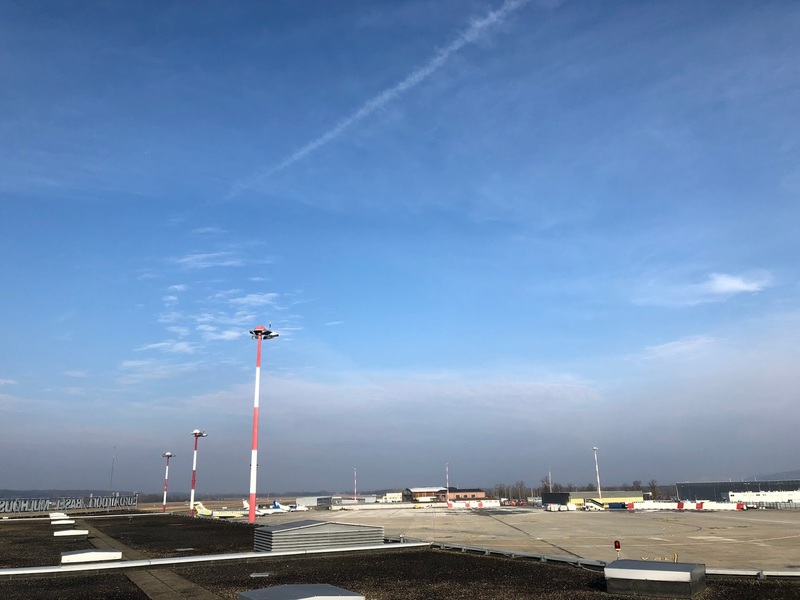 One interesting fact that we learnt is that the airport is actually located in France! So there is a 50% chance that the stamp on your passport belongs to France.